Nokia may not have a multi-touch screen, but they do have a few things up their sleeve that Apple doesn’t. 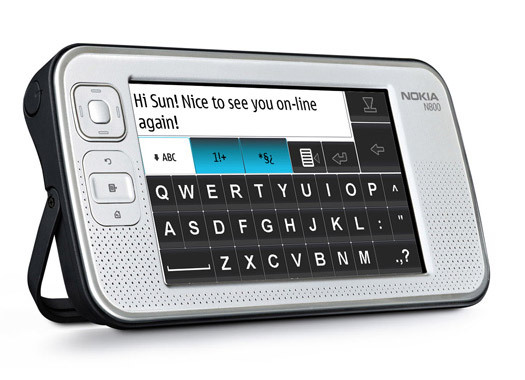 The N800 isn’t a phone per se, but the Wi-Fi feature coupled with the latest upgrade makes the tablet a force to be reckoned with. The latest build, 4.2007.26-8, includes Skype, Adobe Flash 9, memory card support up to 8GB (potential support up to 16GB) and improvements to the battery life. The battery life improvement can be accredited to improvements made around the wireless connection. Content on external memory cards are also read more efficiently to help improve the longevity of the device. A handful of other pre-installed content comes along with the upgrade. Internet radio channels have been updated as well as an easier way to install Real Rhapsody. A tablateer info applet and piquant (?) new Web sites have also been included. The Nokia Internet Call Invitation, which was in beta, is now over and the service will be teminated as of 08-31-2007.